14 Plaistow Lane, Bromley, Kent BR1 3PA, UK. 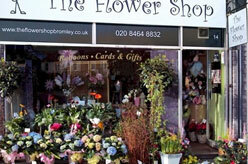 The Flower Shop, Bromley is one of the finest florists in south east England. Established in 1987, The Flower Shop, Bromley is a family run business with very friendly and professional staff, serving same day flower delivery to Bromley and surrounding areas. You can order online for same day delivery. All flowers ordered before 1:00 pm (UK time) (Excludes Sundays & Public Holidays) are delivered same day to any destination throughout the UK.